Fun Learning Games for Kids! Already feeling the love in the air? We are! And that’s why I made these sweet Valentine’s Day file folder games. Early learning is way more fun when done through play and File Folder Games along with hands on activities are a great stress free way to learn! This V-day edition is best just around 14th February but as love is a thing that should be present all year round you can use it any time of the year. As these games are fairly easy they are best suited for preschool and kindergarten. Lets have some learning fun! There are 3 different games and your kids (or students) can play them 4 different ways! First pack has “alphabet and counting” games – in the alphabet one kids have to put together hearts (making a whole heart) by matching upper and lover case letters. In the second one kids have to count the number of white dots inside hearts and match them with numbers. Second pack has “shapes and colors” – a game that can be played two ways – either by matching shapes or by matching colors. Kids don’t have to know the names of the shapes (you can also have them name the shapes once they find a match – there are 12 shapes all together and a few might be a bit hard for a preschooler to name). 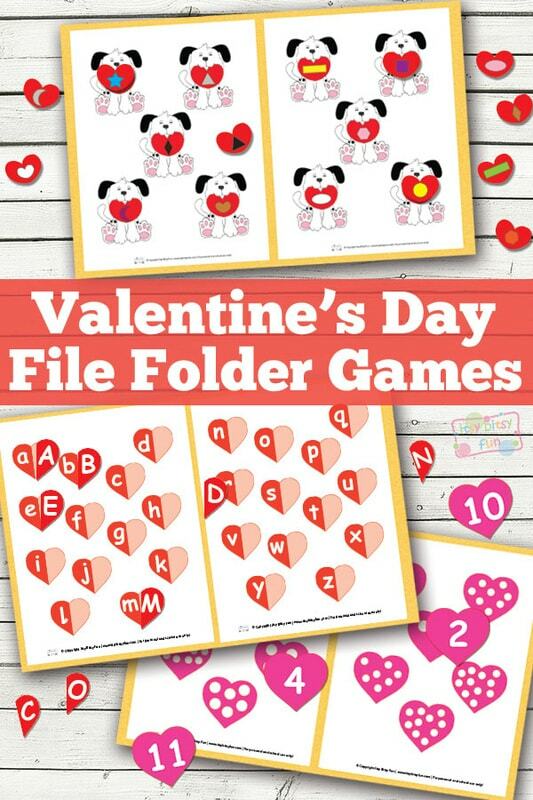 Get your free printable V-day File Folder Games here. Need more fun printables to work on numbers? I think your kids will love these Valentine’s Day color by numbers worksheets. If the’re more into games do check this printable memory game or print this Love themed snakes and ladders game.